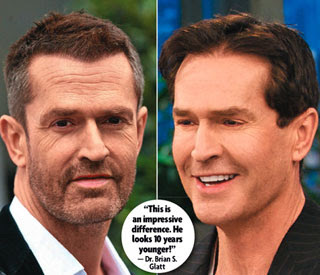 Celebrity Cosmetic Surgery: Rupert Everett or Wax Figure? Wow. What has happened to Rupert Everett's face? I really liked him in My Best Friend's Wedding, but it looks like the British actor is now planning to go for even younger roles! His skin is now smooth and wrinkle free, a possible consequence of Botox and chemical peels. I surmise that he's also undergone a facelift and injections of fillers, possibly Sculptra, to soften his cheeks and deep lines. He now looks like a very young Ray Liotta! ewww, why can't he just age gracefully? it looks unnatural. He was decent looking at one point in his career... Now he just looks bizarre. That's too bad- he's lost all of the character in his face. Wow! that's the power of cosmetic surgery.. I can't believe he could be younger like that.. But I still agree with the others, It's too much that's why he's not the same person at all.. He may look 10 years younger, but the problem is that he doesn't look like Rupert Everett any more... I prefer the before photo. DItto, he used to be a cutie, now he looks kinda creepy. Why why why. He looks awful, what was he thinking? What are your thoughts on Darryl Hannah, speaking of people who don't look the same after too much surgery. I think that maybe looking 10 years younger is not a good thing for him. He must look in the mirror and not even know who he is looking at! Men who dye their hair dark need to dye their eyebrows too. They also need to watch out for that underlying red tone, it looks fake as heck.